Keep track of the latest transfers across Europe, with the summer transfer window open for business. MADRID (AP) — Inter Milan has signed defender Joao Miranda from Atletico Madrid. Atletico says that the 30-year-old Brazilian center back will play for Inter after the two clubs reached a deal. Miranda spent four seasons at Atletico, helping it win the Spanish league, Europa League and Copa del Rey. Atletico says on its club website that Miranda "will always be remembered by Atletico's fans for his goal that gave us the 2013 Copa del Rey" in the final against fierce rival Real Madrid. ​Atletico has already sold striker Mario Mandzukic to Italian champion Juventus, replacing him with Jackson Martinez from FC Porto. SEVILLE, Spain (AP) — AC Milan has acquired Colombia striker Carlos Bacca on a transfer from Spanish club Sevilla. Sevilla announced the deal on its club website. The 28-year-old Bacca helped Sevilla win back-to-back Europa League titles in the last two seasons. His 20 goals in the Spanish league last season made him the competition's fifth-leading scorer. 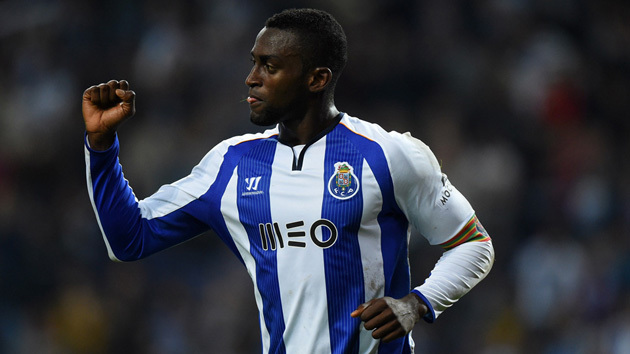 LISBON, Portugal (AP) — Atletico Madrid is paying 35 million euros ($39 million) to bring Colombia international Jackson Martinez from FC Porto. The Portuguese club said in a statement to the Lisbon stock exchange late Tuesday that Atletico had agreed to meet the striker's buyout clause. Martinez has been the top scorer in the Portuguese first division for the last three seasons. He'll help boost a front line that lost Mario Mandzukic to Juventus, with the Croatian signing a four-year deal with the four-time reigning Serie A champion. Atletico Madrid was dethroned as Spanish champion last season by Barcelona. Martinez just wrapped up his time in Copa America with Colombia, which was ousted by Argentina in penalties. MUNICH (AP) — Bayern Munich signed Brazil midfielder Douglas Costa from Ukrainian side Shakhtar Donetsk on Wednesday. The 24-year-old, whose full name is Douglas Costa de Souza, signed a deal through June 2020, and will wear the No. 11 jersey, Bayern said. "A dream has come true for me today," said Costa, who will join his new teammates on July 11. "I'm proud to become a player for Bayern, following in the footsteps of so many magnificent Brazilian players." Donetsk said Bayern was paying 30 million euros ($33 million) for the player whose contract with the club ran to 2018. After joining Donetsk from Gremio in January 2010, Costa scored 38 goals in 203 competitive games and helped the side to five consecutive titles from 2010-14, as well as three Ukrainian Cup wins. "Douglas Costa will be good for our team," Bayern sporting director Matthias Sammer said. "He has great technical ability, a powerful left foot, he is very agile, and extremely quick." Costa can play on either flank, and is expected to provide an alternative to injury-prone wingers Franck Ribery and Arjen Robben. Ribery will miss the start of the season because of persistent ankle problems. LIVERPOOL, England (AP) — England defender Nathaniel Clyne became the fourth player to join Liverpool from Southampton in the past year after signing for a reported fee of 12.5 million pounds ($19.7 million) on Wednesday. Liverpool said Clyne moved on a long-term contract for an undisclosed fee, making the attacking right back the club's sixth arrival of the offseason. Liverpool has also signed Roberto Firmino, James Milner, and Danny Ings this offseason, as well as back-up goalkeeper Adam Bogdan, and young defender Joe Gomez following a disappointing season. Dejan Lovren, Adam Lallana, and Rickie Lambert left Southampton for Liverpool last summer for a combined cost of nearly 50 million pounds (now $79 million). Clyne will replace Glen Johnson, who has been released by Liverpool this offseason. The 24-year-old Clyne has established himself as England's first-choice right back this year. "As soon as Liverpool showed their interest in me I was happy, and just wanted the deal to go through," Clyne said. "It's definitely a good opportunity to come here and try to fulfill my potential." SEVILLE, Spain (AP) — Sevilla says it has reached an agreement to sign French international defender Adil Rami from AC Milan. The Spanish club says Rami is set to sign a four-year contract. Rami previously played for Valencia in La Liga. Sevilla will play in the Champions League next season after successfully defending its Europa League title.